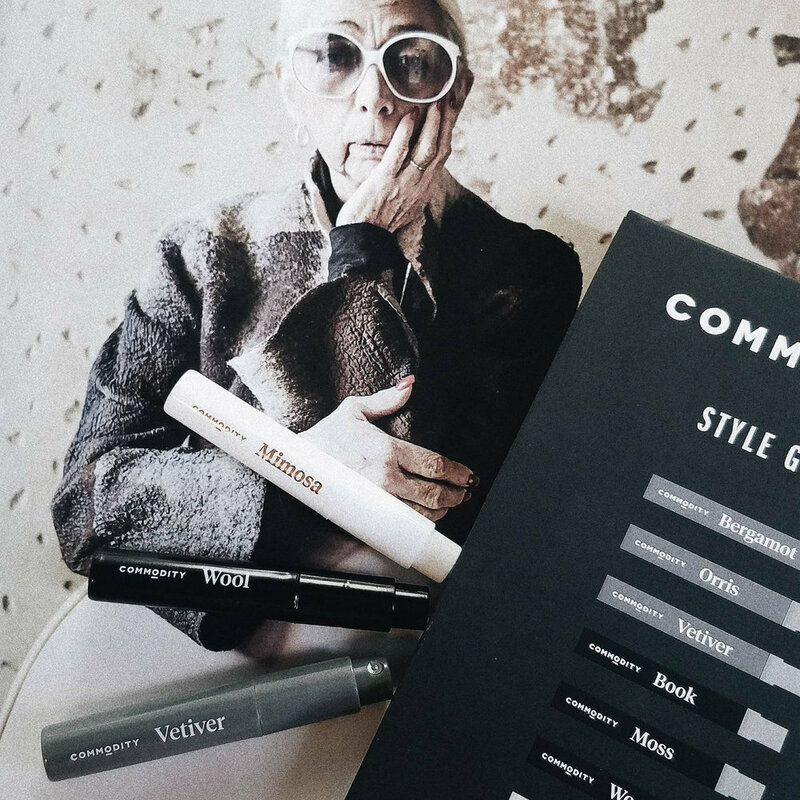 I was so thrilled to receive Commodity's style guide a few weeks back, and I've been itching to review the fragrances ever since. Commodity is an international fragrance company that is made up of several individual perfumers. It was established by Konstantin Glasmacher and Ash Huzenlaub in 2014, and has since taken the world by storm. 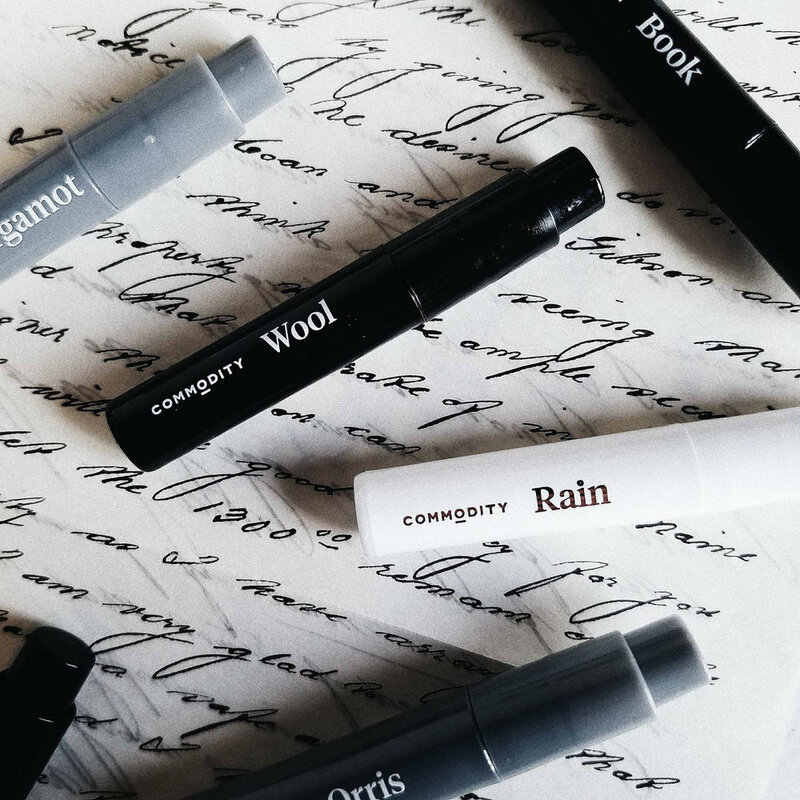 This cruelty free brand is made up entirely of artisans who often go outside the bounds of "traditional perfumery" to come up with fine fragrance, body, and home scents that are unique, diverse, and unisex. First off, Commodity’s packaging is by far the best I've ever seen. It was an absolute joy to photograph, and I had a lot of fun reviewing the scents themselves. While I enjoyed sampling all of these beautiful fragrances - Book, Moss, and Wool really stood out to me. They are some of the most original, inspiring fragrances I’ve smelled this year. Despite appearances, Commodity does not specialize in realistic 1 note fragrances. Their fragrances are aimed more for the general public, and the general public is not ready for real sri lankan vetiver oil. 😉 Mainly because it smells like a graveyard (but hey, the goth in me loves it)! This brand’s fragrance style is very sleek, modern, and relies heavily on fantasy notes which means it could work in upscale, commercial boutiques along with more niche, indie shops. If you’ve smelled Demeter fragrances, you’ll know that they aim to capture the EXACT scent of a memory, whether it’s dirt or gin or a funeral home. Commodity doesn’t capture exact scents, but it does capture the “feeling” of a memory, which is why it resonates so much with me as a brand. I often describe my perfume collection as “bottled memories”, scents that hold sentimental value for me. 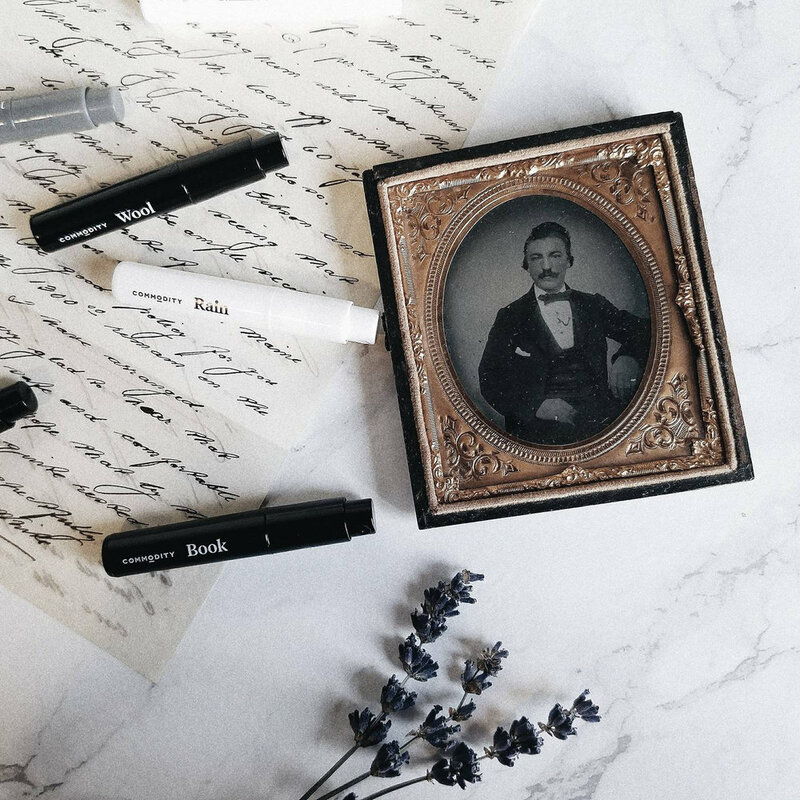 Well Commodity has created an entire line of memories, and I’m certain that there is a scent in store for everyone, no matter what your preferences are. VETIVER: Vetiver is an over-saturated market these days with scents ranging from extremely thin, commercial vetivers (aka complete fantasy notes that have nothing to do with the real material) to musky, natural, oily smelling vetivers. Commodity’s offering falls somewhere in between the two, but it leans closer to a fantasy note than it does to the raw material. This fragrance opens with a strong blast of citrus and a very thin jasmine note. I can pick out benzyl acetate, hedione, and florhydral. It’s surprisingly light for a “woody” fragrance, and relies heavily on the use of floralizers like jasmatone. But nowhere in its construction do I actually smell any raw vetiver material. It certainly has a perceivable cedar note in the drydown, a “cedar chip” type dry woody smell. What I enjoy most about this scent is the dark patchouli note I get in the background. It’s about as close to raw vetiver as this fragrance will come, and it’s extremely pleasing. The longevity is average, it lasts about 5 hours on my test strips and 4 hours on my skin but packs a punch while it lasts! Sillage is excellent! This is a perfect vetiver fragrance for people who don't like real vetiver oil. I happen to love the stuff, but I still enjoy a good fantasy interpretation and Commodity does that so well. Vetiver layers like a dream with everything. This is an office friendly, inoffensive scent that you can wear just about anywhere. I see a full size in my future! BERGAMOT: Stephen Nilsen is responsible for fragrances like Tommy Hilfinger’s True Star, and Donna Karan Gold so when I heard he had partnered up with Commodity to create Bergamot, I expected a light, breezy scent. In typical Nilsen fashion, Bergamot is all things light and transparent. The opening is pure lemon, but the heart of the perfume smells EXACTLY like the Italian bergamot essential oil you can get from @edenbotanicals (try their FCF variety, it’s divine!) There is a match-esque tea leaf note that smells JUST like Robertet’s mate nhs – a fresh, sparkling, diffusive, green aroma with a tea-like top note and cold tobacco-leathery dry down. I catch whiffs of what could be ionones, a powdery sort of smell. But ultimately this perfume dries down to a beautiful patchouli note with a hint of jasmine. As it progresses, it smells more and more like earl grey tea. Nilsen has captured the essence of the bergamot fruit beautifully. If you like simple, linear, and clean scents this is a great option. It manages to be elegant and light without veering into soapy territory. The longevity is brilliant for top-note heavy scent, it lasts 8+ hours easily on my test strips, and 6 hours on my skin. ORRIS: Here is where Stephen Nilsen fails me. Full disclosure: I am a huge orris butter fan. I collect orris oils of all varieties. I fanatically study every piece of literature I can get my hands on, trying to re-create this fabulous (but painfully expensive) scent. I have on GC\MS report of aged orris absolute that is basically gold to me. So I do not come to this fragrance with a clean slate, I had expectations and lots of them! Orris by Commidity is NOT a literal orris fragrance. If you’ve actually had the opportunity to smell aged orris root, you’ll recognize the powdery irones that give it its unique scent. I knew that there was no chance of finding real orris concrete in this fragrance, but I was hoping for some decent recreation using alpha\beta\methyl ionones which can successfully mimic the powdery undertones of the orris root. What this fragrance actually is, is a very pleasant white floral that smells nothing like orris root. It's more like an iris perfume! There is most certainly lilial, a powdery muguet type chemical responsible for the fresh, green, light sweetness. Hedione is used for its transparent jasmine tea-like note. Linalyl acetate seems prominent in the drydown, giving it a fruity pear like edge. But ultimately Orris utalizes aldehydes like cyclamen to give it a sparkling, ultra modern, fresh feminine feel. I can only say good things about the construction, it has lift in all the right places. But if you came here looking for a realistic orris root fragrance, as I did, you will need to look elsewhere. Longevity is fantastic, lasting 8 hours on my test strips and 6 hours on my skin! If you're in the market for a beautiful fantasy white floral perfume, you'll be thrilled with Commodity's Orris! BOOK: Ketrin Leka is a Robertet perfumer who I actually have been really intrigued by for years. I considered studying with Robertet myself but I didn’t want to be stuck working for them for the rest of my life. Ketrin flew under the radar for 13 years before she was chosen as a finalist in CEW Beauty Insider Awards (indie fragrance category). I read a review of her describing her childhood in Albania, her emigration to New York, her love of photography, and her desire to translate story telling into fragrance. Indeed, she and I sound like we would be fast friends. She also happens to love working with natural materials, a total passion of mine, and I can tell that she’s utilized several in her Book fagrance. Cucumber aldehyde, eucalyptus absolute, and lavender. This fragrance opens with a bowl of freshly sliced cucumbers. It’s such an odd choice for a literature inspired fragrance, and I absolutely love it! The cucumber aldehyde completely dominates the opening and heart of the perfume. Once it finally fades, I do catch whiffs of cypress leaf, moss, and eucalyptus which further add to the greenness. Book is vegetal, woody, light, and spicy – four things I never thought I would smell all in one fragrance! This has got to be the strangest scent in their entire style guide, and is easily my favorite. Book does not actually smell anything like books, it smells like a garden of vegetables sitting next to a pile of cedar chips with a hint of black pepper. But it’s so fresh, unusual, and inspiring, I could definitely see poems being written about it. Book has pretty good lasting power, at least 8 hours on my test strips and 6 hours on my skin. The sillage is very low, but not terrible. If you like woodsy, sweet, spicy, fresh, and light fragrances with a unique construction, you’ll love this. It’s easily one of the most fascinating scents I own and by far the most complicated fragrance in this collection. MOSS: Immediately I’m hit with a blast of elemi and petitgrain, two notes I never thought I’d find in an oakmoss inspired fragrance. This is such an odd choice, and again I’m thrilled (can you tell I love strange scents?) There is something turpentine-like about the opening, almost like tea tree oil, but not as sharp or medicinal. Then the scent morphs into something quite spicy with black pepper and eucalyptus notes showing up in the heart. It’s extremely fresh and totally unlike oakmoss absolute. What I expected was a sweet, sticky, jammy, green sort of scent. What Moss REALLY is - is a fresh, spicy, green, citrus, modern vegetal chypre. It’s SO interesting and so different from anything I’ve come across before, and I've smelled a ton of oakmoss scents in my day. I LOVE this fresh take! Donna Ramanauskus is the perfumer responsible for Moss and she’s also created Commodity’s Gold, Tea, Wool and Magnolia scents. I’m interested in trying more of her work now, as Moss is one of the strangest note combinations I’ve come across and yet so beautifully constructed. She clearly is a very creative and talented lady! The sillage is average but the longevity is quite good, it lasts 8 hours on my test strips and 6 hours on my skin. I wish it diffused a little more, but it’s a nice intimate skin scent that you can wear like a personal secret. Well worth the full size, in my opinion. This is fascinating stuff! WOOL: This is another Donna Ramanauskus creation, but much more commercial than Moss. If you like sweater weather and cozy ambers, you’ll love this scent. It opens with lavender absolute, which is VERY heavy on the coumarin. In fact, for the first 30 seconds all I can smell is coumarin. It’s a pleasant, sweet, smell almost like caramel and almonds, but with a greener\herbal edge to it. The scent is extremely natural, almost as if it was constructed with essential oils. It’s cozy, sweet, soft, and musky. The apple comes out in the heart of the perfume, which only adds to the sweetness. By the drydown, I’m still smelling the coumarin, but it’s joined by vanillin and grey musk. This is FAR more simple and linear than Moss, but it’s extremely likable and easy to wear. Most people will find this scent comforting, like a warm hug from your grandmother, or a plate full of homemade cookies. It reminds me of Commodity’s Gold fragrance, which is made by the same perfumer. It’s slightly darker and muskier, but similarly sweet and vanilla heavy. Easy to wear, and easy to layer. The longevity is average, about 8 hours on a test strip and 4 hours on my skin. The sillage is low, if not imperceivable. This is an intimate skin scent, aka “your skin but better”. GOLD: This is a benzoin forward fragrance. If you’ve never smelled benzoin before, it smells like sweet, warm caramel and the deepest of ambers. The opening is all coumarin tonka sweet, and it remains that way during the drydown too. But Gold is not a straight up gourmand by any measure. It’s sweet, yes, but it’s also a sophisticated vanilla. This is a very basic fragrance that is sure to please a variety of people. It’s tame and unadventurous, but extremely warm and cozy. The projection is quite poor but the longevity is ASTOUNDING. It lasted 36 hours on my test strip, and over 12 hours on my skin. A very sensual, natural smelling fragrance similar to vanilla pudding (but more elegant). If you like sweet, cozy scents you’ll love Gold. It’s very aptly named. This is like Wool’s simpler, sweeter cousin. They layer beautifully together. MIMOSA: Mimosa is one of the most commercial fragrances I’ve smelled from Commodity. The opening is absolutely delicious, it smells just like a citrus grove. But quickly the jasmine and geranium come crashing in, making this once citrus perfume turn into a more generic floral. The opening is all tangerines and mandarins, a beautiful sharp, green, tangy type of orange smell. But the heart and dry down is totally dominated by grandma florals, a soapy air freshener type scent. This is not a perfume I want to inhale from up close. There is a harshness to it, almost like cheap laundry detergent. But from far away I catch whiffs of white florals, citruses, and something that smells like white linens. The opening is gorgeous, but then it veers into soap territory. Longevity is average, about 5 hours on my test stipand 4 hours on my skin. I’ve had mixed reactions from other people while wearing this one… many didn’t like the scent, as in, “you smell like my grandma’s bathroom” type of comments. But a few people thought I smelled sweet and romantic. :) Does Commodity's Mimosa smell terrible or does it have redeeming qualities? You’ll have to be the judge yourself. Skin chemistry and nose preferences are so diverse, but my nose is decidedly not a Mimosa fan. RAIN: I am something of a rain and petrichor fanatic. I have smelled some incredible aquatic scents in my day, but many fell flat. Like most rain inspired commercial fragrances, Rain by Commodity reminds me of shampoo or a cheap drugstore cologne. What I DO like about this fragrance is the fact that it’s aquatic but still quite warm (not harsh and cold or metallic like some rain inspired fragrances). I wish I could find more to say about it, but it’s average enough that I’m a bit uninspired with this review. It's not terrible by any means but it's just not my cup of tea. Rain is completely floral and soapy, not at all salty or rainy like I was hoping. The longevity is average, about 6 hours on my test strip and 3 hours on my skin. If you like fantasy rain notes, you might want to give this one a try! It's sure to have a few fans, even if my nose didn't agree. I absolutely love that Commodity has such a variety of perfume styles in their style guide. Even if I didn't enjoy the last two scents I tried, there are sure to be people who love them! You can find the whole range here, from unusual\niche fragrances to commercial\generic scents. Their Book and Moss scents are a revelation to me! The use of unusual note combinations is so inspiring. I love how easy it is to layer all these beautiful scents together. Commodity's perfumers are some of the best noses in the business. I am itching to try more, and I can’t wait to tell you all about it!